Storey Publishing recently sent me this wonderful crochet pattern book by Edie Eckman to test and review for a Christmas Blog Hop. Because it combines everything I love into one festive event (Christmas, blogging and yarn), I was more than happy to participate and contribute. My first thought upon opening the book is that there's a huge variety of patterns to choose from, despite the package it arrived in being relatively small. I was impressed, even more-so after flipping through its pages and realizing that hey: I'd actually make most (if not all) of the book's featured projects. I can't tell you how often I purchase a pattern book for only one project, which is truly a waste of money in the end; this book is not a disappointment when it comes to the number of patterns included vs the number of items I want to make. Kudos! The stocking itself is sturdy thanks to the type of stitching used, and I imagine it would look amazing with a multi-colored yarn, too! But if simple is more your style, then don't worry - the picot edging at the top certainly jazzes it up to make it more than basic. 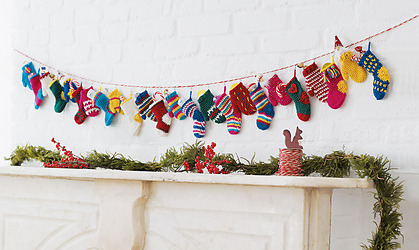 It's a fantastic project if you're a newly-intermediate crocheter looking to create holiday decor. In addition to clearly written patterns, many include stitch diagrams, as well. Because these patterns often rely on smart construction and textures to create each shape, stitch diagrams can often be important for visual learners. Basically, there are a number of ways to accomplish the final result, making this book super versatile. Everyone knows that when it comes to Christmas, I have two obsessions: nativity scenes and advent calendars. So consider the garland added to my list. I already know where it'll hang, so now I just need to pile up my scrap holiday yarn and get to making!